Tempe, Ariz., authorities have released some footage from the self-driving vehicle which killed a pedestrian Sunday, and the video reopens the possibility that some combination of the autonomous Uber SUV or the backup driver might be at fault. 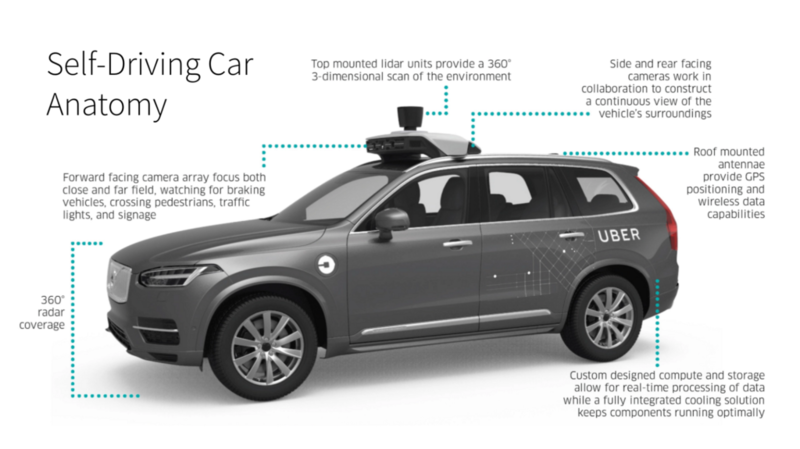 Yesterday, it appeared that Uber and its backup driver might be exonerated; Police Chief Sylvia Moir told the San Francisco Chronicle it appeared that victim Elaine Herzberg, 49, stepped out in front of the vehicle too quickly for the AI or human driver to detect. “It’s very clear it would have been difficult to avoid this collision in any kind of mode (autonomous or with a human) based on how she came from the shadows right into the roadway,” Moir told the Chronicle. Automotive News has since reported comments from a Tempe police spokesman describing Moir’s comments as mischaracterized. “While we recognize two media outlets have attributed exclusive interviews with the chief, we respectfully disagree with how their claim of interviews have been characterized,” spokesman Sgt. Ronald Elcock said in a statement. The video shows the backup driver looking down before being startled by the impact, and Herzberg clearly walking a bicycle perpendicular to the vehicle, neither of which speaks well about the Uber system’s performance. While a camera might have been tripped up by the nighttime scene, the system also has lidar and radar. Distance can play a role depending on the quality of the vehicle’s radar and lidar — detecting something and deciding what to do about it is constrained at some point by the speed of light and the time it takes the autonomous “brain” to calculate what to do. However, it’s hard to see how this would have been a factor in this incident. Continental, for example, sells long-range radar for normal passenger cars that can see up to 250 meters depending on field of view, and a popular lidar Velodyne “Puck” can “see” 100 meters. The Chronicle reported the XC90 was traveling 38 mph in a 35 mph zone, though Jalopnik reported that based on Google Maps, it might have been a 40 mph region of the road. A 38 mph vehicle covers 16.99 meters per second. Wired cited an autonomous vehicle expert who argued that the car should have been able to detect Herzberg. “The video is disturbing and heartbreaking to watch, and our thoughts continue to be with Elaine’s loved ones,” an Uber spokesperson told the magazine. Wired also wondered if an autonomous backup driver could really be expected to maintain an acceptable level of focus for their entire shift, an interesting point. We’ve covered earlier the issue with human-machine handoffs — humans require a few seconds to get their head in the game, so to speak. Such questions surrounding the testing might dictate how quickly the technology comes to market and begins to affect collision volume. Legislation on autonomous light vehicles and their commercialisation in the US, has until now only been subject to a patchwork of state level regulations that differ across the country. AV developers have flocked to states like Arizona, which have arguably less stringent rules on the use of AVs and fewer requirements for making test results publicly available. However, with the accident having occurred in the less-regulated Arizona area this may now fuel the argument that a more strict and national level legislation is required in order to stop a legislative ‘race-to-the-bottom’ where states relax key legislation in order to attract AV investments. This is in line with our key view for 2018 that autonomous vehicle regulation would be sharply ramped up over the year. The system is interesting because it appears to be the first publicly available hands-free self-driving option (the cheapest version is a $5,000 upgrade to the $65,295 Premium Luxury trim), and a CT6-certified shop (or even an uncertified repairer doing cosmetic work) could theoretically encounter a vehicle with it tomorrow — it was available optional on all Premium Luxury trims and all Platinum trims made after Sept. 6, 2017. However, it still requires the driver to monitor the road, and software will monitor you with an interior camera and alert you if it deems you’re paying too little attention. If a driver seems incapacitated, the car will stop itself and alert authorities with OnStar.